Adjust oven rack to lower-middle position and preheat oven to 300°F. Combine 2 cups cream, sugar, and salt in medium saucepan; with paring knife, scrape seeds from vanilla bean into pan, submerge pod in cream and bring mixture to boil over medium heat, stirring occasionally to ensure that sugar dissolves. Take pan off heat and let steep 15 minutes to infuse flavors. Place Silpat mat, or kitchen towel, in bottom of large baking dish or roasting pan and arrange eight 4-5 ounce ramekins on towel (to prevent them from sliding). Bring kettle or large saucepan of water to a boil over high heat. After cream has steeped, stir in remaining 2 cups of cream to cool down mixture. Whisk yolks in large bowl until broken up and combined. Whisk about 1 cup mixture into yolks, until loosened and combined; repeat with another 1 cup cream. Add remaining cream and whisk until evenly colored and thoroughly combined. Strain through a fine mesh strainer into 2-quart measuring cup or pitcher; discard solids from strainer. Pour or ladle mixture into ramekins, dividing it evenly among them (a little more than halfway). Carefully place baking dish on oven rack. For this next step, leave one ramekin out to pour boiling water, then add the ramekin. Pour boiling water (a tea kettle works great!) into dish until water reaches 2/3 height of ramekins, taking care not to splash water into ramekins. 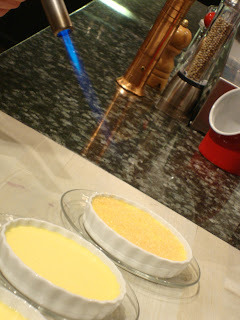 Bake until centers are just barely set and no longer sloshy (about 30-35 minutes or 25-30 for shallow fluted dishes). Check 5 minutes before recommended time. Uncover ramekins and if condensation has collected, gently use paper towel on surface to soak up moisture. Sprinkle each with about 1 tsp. Turbinado sugar (1½ tsp. for shallow dishes); tilt and tap ramekin for even coverage. Ignite torch and caramelize sugar. Let cool slightly and serve. *For a deeper ramekin, allow 10 minutes longer to cook. This stew is best made one to two days in advance, allowing the flavors to develop. You can also freeze it up to three months. To serve, thaw in the refrigerator and simmer very slow for 10-15 minutes on the stove. Recipe from Sur la Table cooking class, adapted from Mastering the Art of French Cooking by Julia Child. Heat a 10-inch heavy oven-proof casserole on medium heat and add oil. Sauté bacon pieces until lightly browned (about 2-3 minutes). Remove bacon with a slotted spoon and drain on a metal rack placed over a baking sheet; when cool, place in a medium bowl. Leave oil and bacon fat in casserole. Heat casserole over medium heat. If casserole is too dry, add another 1-2 tablespoons oil and brown the carrot and onion. Return the beef and bacon to the casserole with the cooked vegetables; season lightly with salt and pepper. Sprinkle flour over the meat mixture and toss lightly to coat. Stir in wine and add enough stock to barely cover the meat. Add tomato paste, garlic, thyme springs, and bay leaf. Bring to a simmer over medium heat. Cover the casserole and place in preheated oven for 2½ to 3 hours. The meat is done when a fork pierces it easily. While the beef is cooking, blanch the pearl onions rapidly in boiling, salted water until tender (about 4-5 minutes). Drain and let cool, then trim ends and peel. Set aside. In a large roasting pan, place butter and oil. Add onions and mushrooms and stir to combine. Drizzle with sherry vinegar and season liberally with salt and pepper. Place roasting pan in oven with casserole and roast, stirring occasionally, until onions and mushrooms turn golden brown and most of the liquid has evaporated (about 20-25 minutes). Remove roasting pan from oven and place onions and mushrooms in a medium bowl. Set aside. When the meat is tender, pour the contents of the casserole into a sieve set over saucepan. Wash out the casserole and return the beef, vegetables and bacon to it. Discard the thyme springs and bay leaf. Distribute the cooked onions and mushrooms over the meat. Pour sauce into a fat skimmer and pour off skimmed sauce into a small saucepan over medium heat, leaving the fat behind. Simmer for 1-2 minutes, skimming any remaining fat off the surface with a small ladle. Continue cooking the sauce as needed to coat the back of a spoon. Taste carefully and season sauce with salt and pepper; pour the sauce over the beef, vegetables and bacon. To serve, cover the casserole and simmer 2-3 minutes, basting the meat and vegetables with the sauce. Serve in individual shallow bowls garnished with shopped parsley. To make the soup, place a large, heavy soup pot over medium heat. Add the butter and the leeks, shallots and onions, stirring frequently for 15-20 minutes or until deep golden. Add the sherry and cook for 1 minute more. Stir in the broth and garlic. Bring to a simmer and cook, uncovered, for 20 minutes. Taste and season with S&P. To serve, preheat broiler on high. Top 8 baguette slices with grated cheese. Fill 8 ovenproof soup bowls or ramekins with soup, leaving ½-inch space at the top of the bowl. Place filled soup bowls on a sheet tray. Top each soup bowl with a crouton and toast 6 inches from broiler, until cheese melts and turns brown in spots (about 3-4 minutes). Carefully remove tray from oven and serve immediately! Preheat oven to 425ºF. To prepare soufflé molds, grease the inside surfaces of eight 6-ounce individual soufflé dishes or ramekins with softened butter. Sprinkle inside of each with grated Parmesan, tipping to coat evenly. Set on a baking sheet. *To make soufflé base, melt butter in a large saucepan over medium heat. Sprinkle flour over melted butter and whisk together to eliminate any lumps. Cook the butter mixture over medium heat until it turns light golden, about 6 minutes. *Slowly pour milk into butter mixture, whisking rapidly to combine. Season with salt and pepper. Continue whisking the milk mixture over medium-low heat until mixture coats the back of a spoon, about 15 minutes. Stir in grated cheese and season with salt and pepper. Keep warm. In a large mixing bowl, whisk egg yolks thoroughly. Whisking constantly, slowly drizzle the warm milk mixture into the yolks. Continue whisking while slowly pouring all the milk mixture into the yolks. Pour the soufflé base back into the saucepan and place over medium heat. Continue whisking while cooking the base until it coats the back of a spoon, another 4-5 minutes. Do not allow the base to boil. Remove from heat and place base in a large mixing bowl. Using a stand mixer fitted with a wire whip attachment, beat egg whites on medium speed until shiny and firm but not stiff, about 4-5 minutes. (Start the mixer at the lowest speed setting then gradually increase to medium speed.) Using a rubber spatula, stir 1/3 of egg whites into the soufflé base. Gently fold in remaining egg whites in 2 additions. 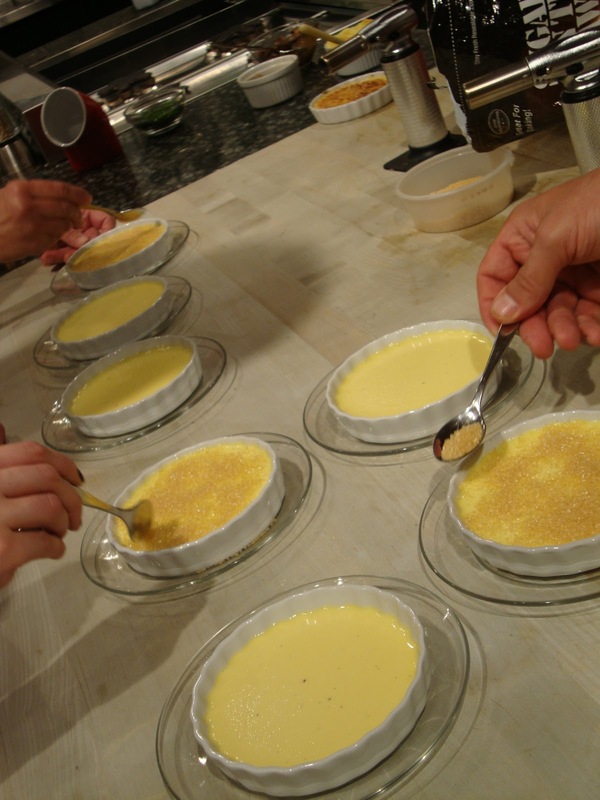 Divide evenly among prepared soufflé molds. Place filled molds on a baking sheet in middle of oven and set timer for 12 minutes. DO NOT OPEN THE OVEN DURING BAKING. When timer goes off, soufflés should be puffed and slightly cracked on top. If soufflés jiggle quite a bit when shaking the pan, bake the soufflés another 2-3 minutes. Soufflés should be light and puffy but creamy in the center. Remove from the oven and serve immediately. *Steps 2 and 3 can be made 1 day in advance. Bring a pot of water to a boil. Add half the asparagus stalks and cook until soft, at least 5 minutes. Rinse quickly under cold water; set aside. On another burner, heat EVOO and 1 Tbsp. butter in a medium pot over medium heat. Add the onion and S & P to taste. Sauté until translucent. Add a ladleful of broth to the rice and stir constantly until absorbed. Repeat this process until you have used all of the broth. It will begin to take longer for the broth to be absorbed; rice will take on a creamy texture. 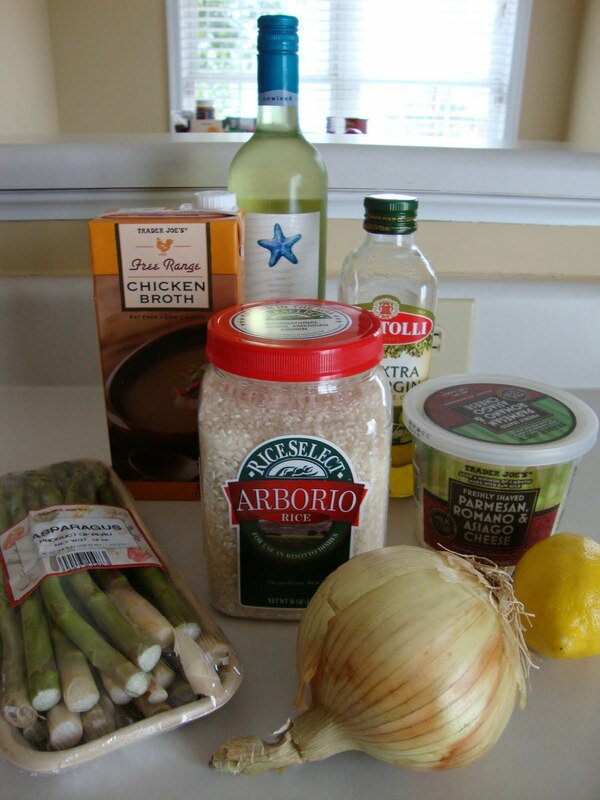 After about 15 minutes, add remaining asparagus pieces and tips, continuing to add stock when necessary. Remove from heat and top with remaining Parmesan cheese; Serve immediately.